The next night the pair came to rest at the house of a very poor, but very hospitable farmer and his wife. After sharing what little food they had the couple let the angels sleep in their bed where they could have a good night's rest. When the sun came up the next morning the angels found the farmer and his wife in tears. Their only cow, whose milk had been their sole income, lay dead in the field. 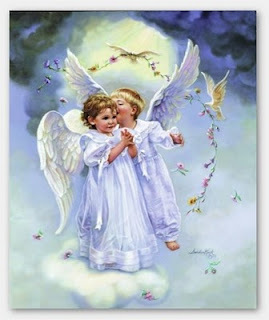 The younger angel was infuriated and asked the older angel how could you have let this happen? The first man had everything, yet you helped him, she accused. The second family had little but was willing to share everything, and you let the cow die. the basement of the mansion, I noticed there was gold stored in that hole in the wall. Since the owner was so obsessed with greed and unwilling to share his good fortune, I sealed the wall so he wouldn't find it." "Then last night as we slept in the farmer’s bed, the angel of death came for his wife. I gave him the cow instead. That's why it's called the present! This is not a dress rehearsal!